About Reckon Data Systems, Inc.
Purchase and sale of used computers, parts and peripherals. Supplier of parts for PC, laptops, servers, workstations, printers, etc. Facilities and warehouse management services. Inventory management and control services. We're dedicated to environmentally friendly practices - click here to read about our Green commitment. The Reckon Data Systems, Inc. offices and attached warehouse / storage facility. The management and staff of Reckon Data have over 20 years of experience in the industry. 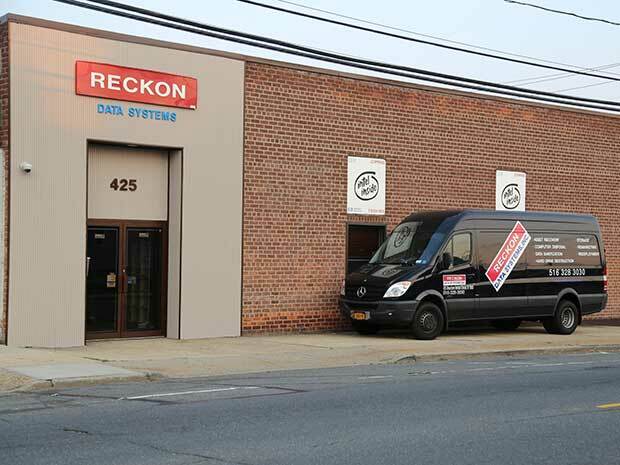 Our 19000 square foot corporate office and technology service center is located at 425 Meacham Avenue, Elmont, NY 11003. Our expertise in the above mentioned services allow us to offer our clients an efficient and cost effective solution to their needs. We stock a huge selection of servers, desktop computers, laptops, monitors, printers, system boards, hard drives, memories, power supplies, network cards, from all the major brand manufacturers. The sales and technical staff at Reckon Data are well trained to support an ever-growing demand not only in the United States but also around the world.